Puerperium -a sweet little sweater with a weird name. I finished up a few baby knits-anyone want to help me decide on some buttons for this little sweater? I realize that the two pinks look almost the same in the picture, but the upper right is more of a reddish colour, and the bottom left are more coral. oh, and we are expecting a girl, or so we're told.I never feel like we can be entirely sure until the baby is actually in our arms. And sitting at the very back of the store behind a very large secretary desk covered in haberdasheries was the tiniest, and probably oldest woman I've ever met, smiling behind her massive, coke bottle amber glasses, hands folded, just waiting for her next customer. I felt like i was walking into a movie, or a wardrobe....another universe. And what was even more delightful but definitely puzzling, was that the prices she was selling these things at were what was actually on the original package. So yes, these buttons cost me 5 cents a package for 40 of them. I bought them ALL. ...and a slew of other goodies as well. I basically kept going back until her store was in my house. I've given a lot of it away for gifts to vintage appreciating friends, and used a lot of it on my own projects as well. I decided a while ago to use some of these buttons though on some baby things because they're just too delicious to let sit in a box. I'd really like to make a couple more pairs, they look so cozy! And they work up really fast. The jumper looks great. Personally, I like the coral buttons, but the blue ones would really pop. Those pants are just brilliant! So cute, and that purple is gorgeous. Lovely! 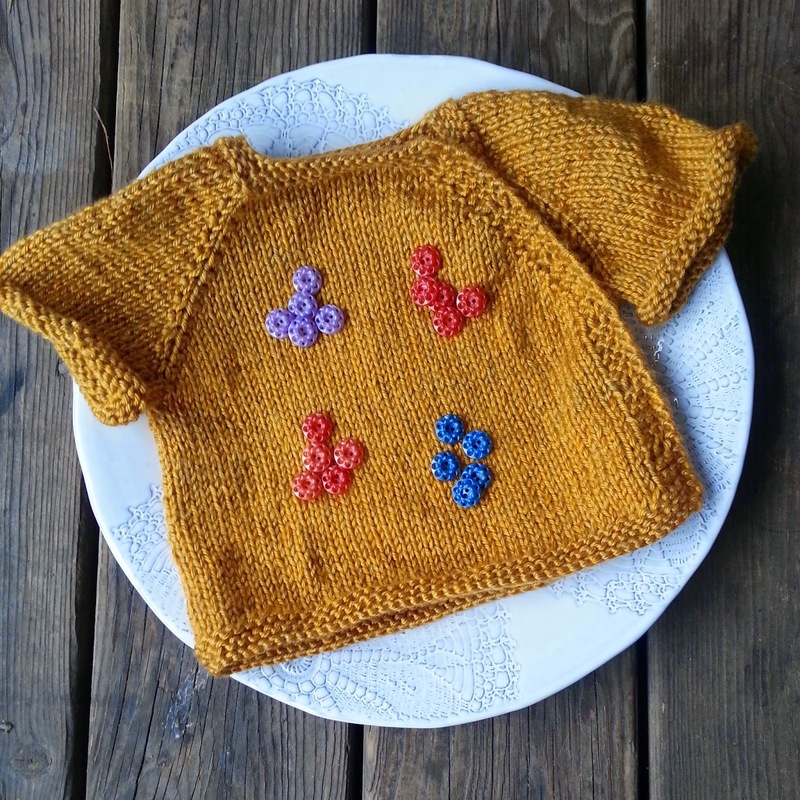 Last fall I made 3 puerperium sweaters for new babies in my life. I didn't use buttons, I sewed a 'snap band' (basically twill with snaps all along - sold at Fabricland by the yard) into each. Great, quick and easy knit...but I still can't pronounce the name! I like the purple or blue buttons. I can't really pronounce it either..I try, but end up just saying " p-p-pppppuh..."
that sweater is so adorable and love the rustic color :) I love how square the pants are and how quickly your little one to be will out grow them!! Oh, so cute! I love the colour of the little cardi. I think the blue buttons would look very special but coral would be nice too. 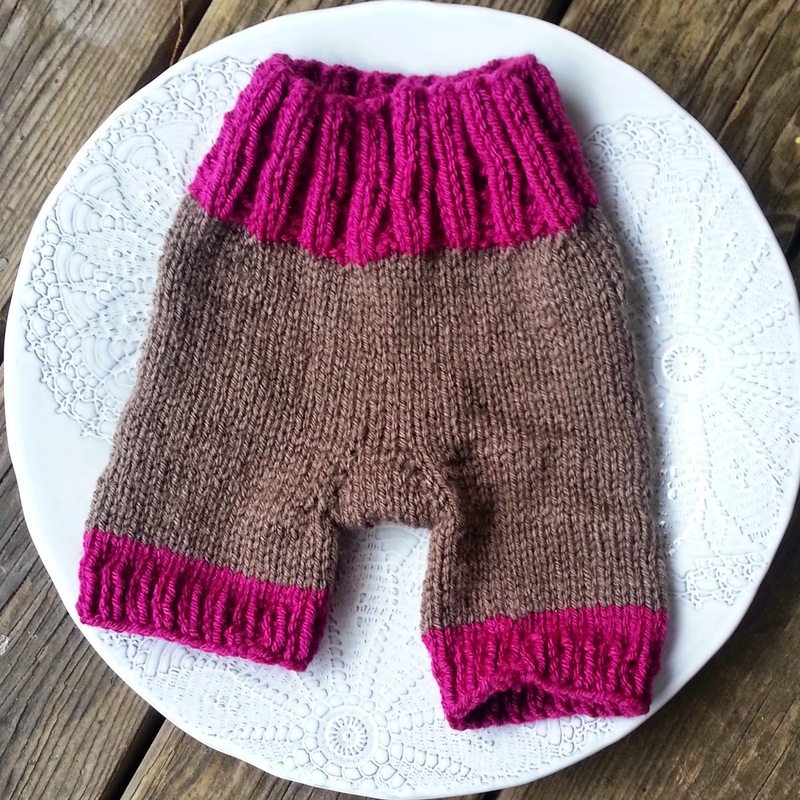 I own two pairs of those little pants and my now 12 week old baby girl is wearing them ALL the time - so easy and super cosy!